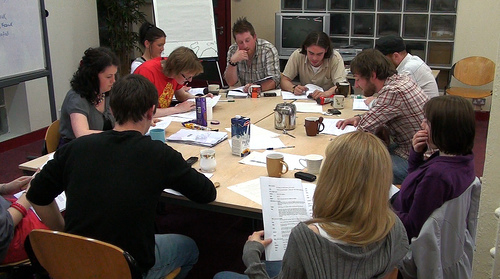 You know, it seems like forever ago that we had our first script reading (above). Some of us have worked on every production, some made their debuts late last year, others have just joined us since June. 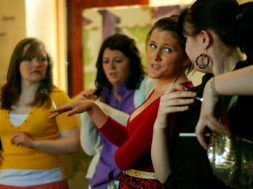 As a group, it was a new gathering of people, getting familiar with each other, trying on the accents, making nervous conversation (though maybe the nervous bit is just my imagination). Flash forward a few weeks and that “new” group have become a tightly nit family of actors. That’s what living in each others pockets for the past fortnight or so will do to you. 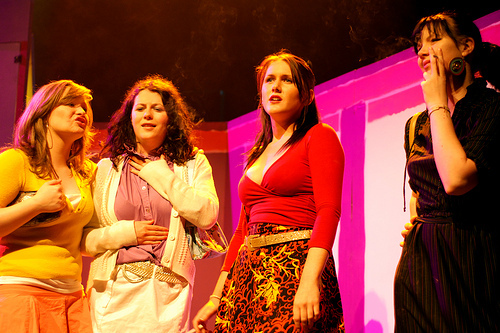 It also sees us at the midway point in our production run, with tonight marking the third of five nights at the Watergate Theatre with Stags and Hens. 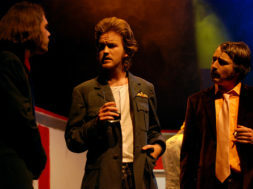 Opening night was great, a real buzz from everyone off the stage, an audience who lapped up and laughed their way through the show. Yesterday was another good run, completely different audience, a gradual build up to the second act where the cast burst with energy through to the finale. Tonight will be another different show. Every night will, on some level. One lovely person after last night’s show commented “I don’t know how you do it. I don’t know how ye can sustain the level of lines you’ve got in that play.” Today we’ll be doing it by resting up. And how! Any tweaks we needed to make to the set were done yesterday, a new floor fitted in which was absent for those in attendance on Tuesday night and with no futher additions (barring a little bit of repainting here and there), it should mean a later start for actors and crew today. These production runs just aren’t long enough. 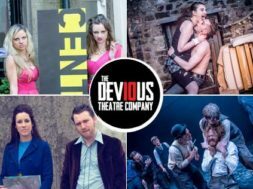 We started with three nights on our first production in 2006, upped things to four in 2007, starting running five-night productions in 2008 and going forward, we need to get the mileage out of these shows so we want to be doing a lot more! Back to today and the countdown is already on to 8pm. The call is for 6, makeup and hair by 7, warmups, costumed by 7:30, side stage by 7:50 and out through those night club doors for 8pm or so. If it’s fun you want, then we’ve got it on tap. You can book tickets in advance by phoning 056-7761674 or by calling to the Watergate Theatre on Parliament Street in Kilkenny. Your time to join the session is running out! Good to hear it’s going well folks. Will see ye Saturday.